ART iT: We were just discussing your exploration into the histories of multiculturalism, activism and squatting. Why do you choose cinema or film as a way to explore these histories and bring them back into the present? WvO: I find that cinema and the cinematic language allow for the widest range of possibilities. It’s not only about the way that cinema requires all these different functions or tracks to work together to make a film, but also the way it accommodates different indexes, such as affect or reasoning, or how it works perceptually. When I started my work in film, I found it was a mode of expression that I could pick up without being literal. 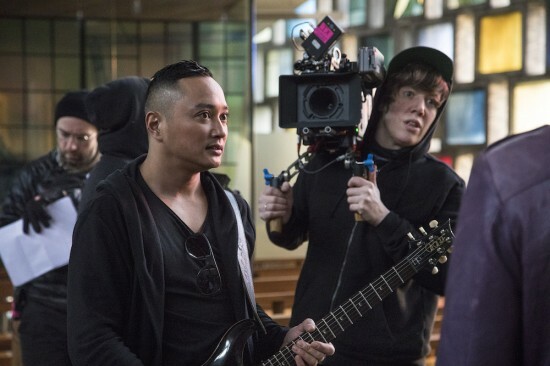 I wasn’t trained as a filmmaker, so I thought, how do you make a film? What does it include? And then I just brought it together and tried doing something with it. You have a camera, you have a microphone, you have people who are interested in sound, you have people who are interested in the image, and then you see what you can do together. So maybe my approach has always been about using a non-method of filmmaking to make films – although in the case of Bette & Deise I came closer to making something “film-like,” because the story pulls you along and you get sucked into it. But I arrived there from other routes than the usual method of setting up a plot, setting up a script, setting up cameras, and so on. ART iT: You often deconstruct the films when you exhibit them. For example, you convert the footage into slide format, or you have the subtitles projected off to the side, as in Apres la reprise, la prise (2009), so that every element of the film is taken apart and spatially distinct. WvO: The slides really intrigued me from the beginning. I started out making slide pieces before I made films, and that was my entry to the cinematic language. It was not so much about pulling the film apart as it was taking a slow approach to the media, on top of which I found the mental process of viewing to be another interesting factor. Slides offer a different understanding than film of what is in front of you and how it changes, because you have more time to look at each image, and you fill it in with your own continuity. Then when the image changes it can disrupt your expectations in a way that is more about you as the viewer than it is about the image itself. I was thinking about that before I thought I could make a film at all, so maybe that’s how this idea of “pulling apart” the film during the production comes back in presenting it for an audience. When I work on a film, I’m always conscious about how you have a sound line, a text line, an image line, and a rhythm – all things that are a little bit separate from each other but have to work together. It also has something to do with how I like to position the viewer – not in a strict way, but more based on the timing of when an image becomes clear, or when the sound becomes audible, or when you can sit or not. It’s always a process of thinking about how the viewer will be in that space and how comfortable the viewer can become. That’s why I keep the architecture of the installations on the small side. I would say my installations are architectural “indications” rather than interventions as such. ART iT: Like stage directions? WvO: In a way. 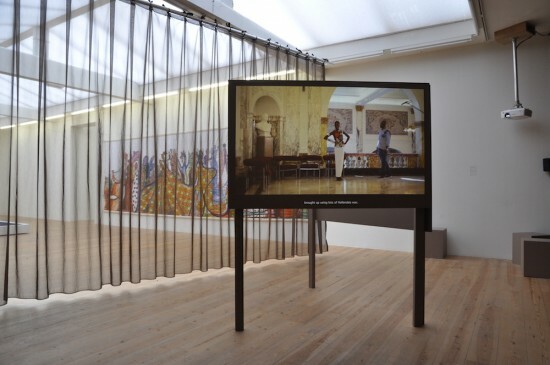 It might have been clearer in the Dutch Pavilion at Venice because of the large panels, which directed viewers in a certain way or created compositional views that suggested relations of connection or disconnection with the other parts of the exhibition. Some images were visible together, and others not. Of course, designing sight lines or a circulation in the space is exactly what architecture is about, and in the pavilion I also made the staircase going from floor to ceiling, which allowed viewers to see the film from different heights and angles, and that affected how people moved through the space and perceived some of those cinematic images. 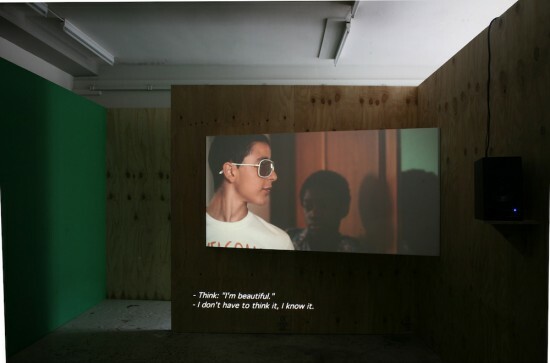 Above: La Javanaise (2012), projected video on two screens with dialogue, 25 min. 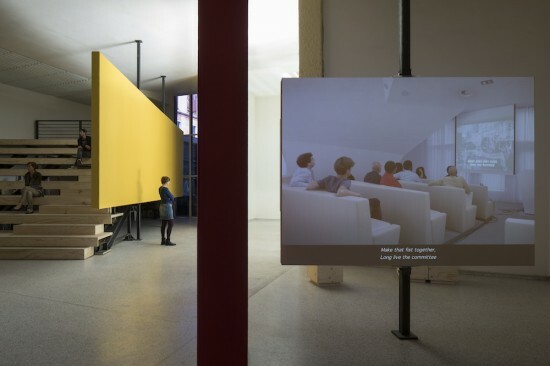 Below: Installation view, Stedelijk Museum Bureau, Amsterdam, 2012. ART iT: You also set your films in specific spaces. For example, La Javanaise (2012) was filmed in the Tropenmuseum in Amsterdam, which is a very complex site. The institution itself is a legacy of colonialism, but its existence also enables visitors to turn a critical lens onto the colonial project. That is, just by its mere existence, the archive has the potential to be activated by all people for all purposes, irrespective of its original ideological context. WvO: My choice of the Tropenmuseum was less about the architecture of the place than its symbolic, ideological function. It’s not only about how the colonial past is represented, but also the colonial present. There’s a representation of otherness in the museum that has been handled in particular ways across different epochs. For example, there are murals from the 1920s that still express a belief in the colonial system, couched in the language of cooperation between East and West or primitive and industrial – of course with the white man leading the way. They’re really quite astounding. Then another representation of the colonial appears in the 1970s, which was done more through displaying crafts and showing an appreciation for other cultures. And then you have the contemporary representation, which is all multimedia, with lots of flashing, interesting films. So the museum itself encapsulates a history of ideas about how to look at the other and how to represent it to an audience, and inadvertently shows how these ideas are constantly being revised. The museum is a mess, basically, but it’s interesting that they somehow keep leaving one regime on top of the other, like a compilation. 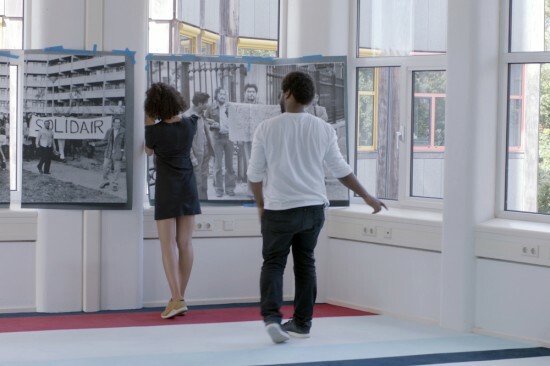 In the film there is a moment when the two participants, the model Sonja Wanda and the artist-theoretician Charl Landvreugd, are standing in front of a mural. Sonja asks, “What was this building, anyways?” And Charl replies, “This is the Colonial Institute, we can’t really talk about it here,” and then he says, “We should talk through our teeth.” During filming there were times when the two said they just had to step outside for a break. It is such an oppressive space, and it’s interesting how Charl and Sonja turned against that whole environment – and against me, too, since as the filmmaker I had asked them to be there. They turned against the whole power structure implicit in the space and in the situation of being filmed. ART iT: This reminds of the scene in From Left to Night where Dean draws a parallel between the surveillance apparatus that was used to put him in prison and the film shoot for your project: “They filmed me. . . . They made up a story from all the fragments, and then I was charged. . . . Now you film me. . . . And then you’ll make up your story. And then I’ll be what, visible?” The dilemma is that while film can be an effective path to visibility, it’s not clear that visibility is inherently a good thing. WvO: Yes, I was really aware of that dilemma in the work, which is why I put the scene with Dean at the very beginning of the film. But I feel I haven’t been able to go further with that same vision. The two pieces I made since then, Squat / Anti-Squat and Cinema Olanda Film (2017), don’t carry that same problematization as strongly in them. Maybe it’s because they were both shot in Holland; it really seems to depend on the people who participate and the dynamic they create. For example, I think there was much less questioning of the language because we were all Dutch in the end, and there was a communality that we shared. Whereas in the case of Dean, it was very ruptured. I’d definitely like to go further in trying to understand what kind of position I can take as the filmmaker. I am involved in it too. But it’s difficult to move from one position to another. Maybe one way to do that is to try to set up a dynamic system where the movement becomes available to everyone. The idea is to create space for someone to just be, and then start to negotiate that. Above: Prologue: Squat/Anti-Squat (2016). Below: Cinema Olanda Film (2017), production still. Photo Daria Scagliola. ART iT: How do you choose the participants? WvO: It depends on the project. Sometimes certain people make sense for the themes I want to explore in the work, so I seek them out specifically. In other cases, it might be someone I already know, or even friends. I think familiarity helps to create a basis for what I can expect. Whatever the case, I try to build up an understanding between us before we do the filming. It’s not like I’m just calling people up. In fact, getting to know the people is the longest part of the process, and sometimes they drop out in the end. Basically I go by subjective choices, and then I have to stand for them. Only rarely do I work with people who all come from the same group, as was the case with the military cadets in Instruction (2009). If I want to create something that can allow for a conversation, then it is important to have differences in background and age. But I should also say that “workshop” is not really the right word to describe my filming process. I bring people together for a film shoot, and the film shoot is a very specific occasion, with a particular tension. It’s not just coming together – it’s coming together for the camera. You are asking the participants to be vulnerable in front of the camera. Each work is an exercise or experiment in different ways of being in front of the camera and performing for the camera. I’m not interested in reproducing already existing formats like the interview or the talk show. I’m looking for more of an improvisational method that can be spontaneous even while it’s cinematic. Maybe it’s limited, but there’s still an array of certain small actions you can use. Even walking together and talking is different from standing together and talking or sitting together and talking. ART iT: That raises the question of whether there is a difference between doing things with a camera and without a camera. Is there a different register of performance? WvO: Certainly for me the camera is one of the main actors in the situation. Of course, this comes from the cinematic tradition and predecessors such as Jean Rouch, who already articulated the idea that the camera is the catalyst of the situation. It makes the situation different, makes the situation what it is. That’s why I never want to deny the camera. I never pretend that I am filming a situation as if I just came across it. The situation exists because I’m filming it. The camera is the main reason, and it relates not only to the camera eye as a recording device, but also to a tradition of image making or even aesthetically being in front of the camera. The entire history of cinema features these beautiful beings that we like and relate and aspire to. Especially when I work with young people, the desire to be in front of the camera is evident. Interestingly, in Apres la reprise I found that the young people had a very strong idea that when they were on camera another future became possible for them. Maybe this is because of the lack of other imaginaries for work. Where is work, where is the possibility of labor? In this day and age the camera is a potential site of work, even if it’s only a fantasy. They would get so excited about the auditions and the film shoot. I felt it even myself. ART iT: It’s amazing how the selfie and sites like Instagram and Snapchat feed into those fantasies of labor. People put work into the photos they are posting online, and the devil’s bargain is that some of them actually do get to become celebrities, while many others don’t. WvO: Yes, it is a really strong desire. So that is part of the dynamic when you ask people to come in front of the camera, and it plays out differently among different generations. Among young people, it seems to have more to do with the mass media and fame. It’s not something I’ve focused on in my practice, but I’m aware of it. ART iT: When I visited documenta this year, I was impressed by how the exhibition brought together so many artists from other parts of the world that are not usually showcased in mainstream culture in the US and Europe. But perversely that very diversity also suggested the idea that Europe is the world’s panopticon: it is only through the lens of Europe that other subjectivities become visible to the world at large. Perhaps we could say the camera is itself a panopticon, even when you only have one camera. WvO: That’s so true. It goes back to Dean, who is in a sense overexposed by always being on camera – overexposed to the extent that he is imprisoned for it – yet he’s also completely invisible in his society. That’s why we need to question the extent to which art or an artist can make something visible. Being visible or making visible does not equate to political action, in terms of changing the power dynamic. It’s just visibility. So from where, by whom, for whom, and for what symbolic field is that visibility being registered? Who is it satisfying? Is that all we’re working with, and if so, what else is there to do? I don’t know the answers, but this awareness is really interesting to deal with.